The web has forever changed the way we transact business, and yet many organizations find they lag behind on their content efforts for exactly these reasons. Gone are the days of arguing about who owns the content: IT or marketing? This department or that department? Your customer doesn't care about any of this. They just want to find the information they need NOW, otherwise, they'll go elsewhere to find it. So what’s a great content or digital strategy professional to do? Learn how to break down organizational silos and build a cross-disciplinary, cross-departmental team designed to create better content, drive interaction on social media, and grow revenue. 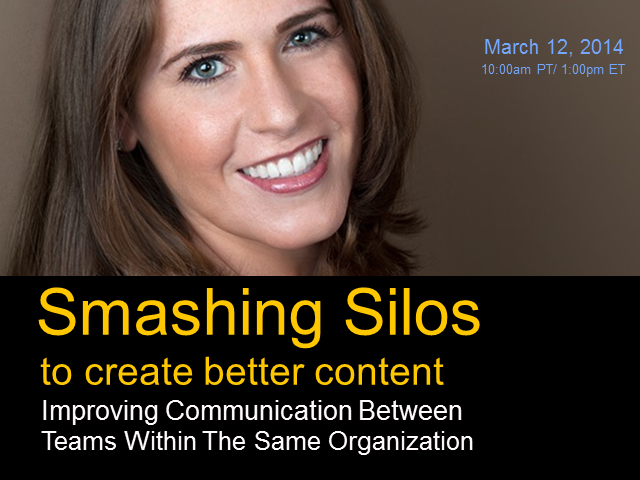 Join me, Scott Abel, The Content Wrangler, March 12, 2014 for this must-attend webinar. All registrants will be entered into a drawing for a free pass to our new conference, Information Development World: The Conference for Technical, Marketing, and Product Information Developers, October 22-24, 2014.